Just for our regular customers of course. Another wet day. Five emergency calls, one purple plus, one conveyed, one time-waster and the others required an ambulance. My first call was to a 55 year-old female with 'no heart beat', given as suspended by Control. There was already a crew on scene but they always send a few of us to a job like this. There is little doubt that it will be as given when the combination of caller description and CAD scripts match up - no ambiguity. I arrived and pressed the entry button for the flats. A few seconds later I was buzzed in by a crying female. I entered the lift and when I got out I could hear her wailing from all the way down the corridor. All of the neighbours must have been aware of her crisis too. I was let into the flat by one of the crew who guided me upstairs. The paramedic was downstairs with the crying woman, so I knew that nothing was being done for the patient. When I got to the bedroom, I saw that the lady lying on the floor had been dead for some time, probably since the night before - nothing could be done. I went downstairs and joined the crew who were consoling the young woman. This was the daughter of the deceased and she was completely beside herself with grief. She kept saying, over and over again, that her mother must have been crying out for her in the night but that she hadn't heard and had slept right through her death. She had gone to wake her mum up this morning and had found her - stiff, discoloured and with her mouth and eyes wide open. This had given her the impression that her mother must have been crying out as she died. This isn't necessarily true. The last few breaths taken by a dying person are usually taken after consciousness has slipped away - they are the body's desperate responses to a drop in oxygen levels and are nervous reflexes. If the last muscular reflex leaves the mouth open, then it will seem as if the person has screamed. I felt devastated for the girl, her mother was only 51 years-old, so she couldn't have been that old herself; she looked to me to be in her late twenties or early thirties. I arranged for the police to attend (the daughter was too upset to remember the GP's details)and left the scene when they turned up a few minutes later. It was a sad way to start the shift. I wasn't required for the next job. It was for a female with DIB and the crew arrived just as I did, so I bowed out - no point in having a whole gang of us descend on the patient. I went back to the station and spent a few hours there, watching telly, making coffee...receiving and cancelling calls (thanks Fred). Then an opportunity to do some real work was wrenched away from me as I set off on it. It was a 'one-under'. This is the term used for someone who jumps, falls or is pushed in front of a train - usually on the underground. These incidents are much more common than you'd think and the first one I ever did ended up as a feature on the TV programme Trauma - the patient in that instance survived until we got him to the platform, where he died of his injuries but not without a long and dedicated attempt to keep him going - all in front of a TV crew. Anyway, I never got to deal with this one because I was cancelled and sent to deal with an 18 year-old 'collapsed' around the corner instead. In theory it should have taken me two minutes to get there but, largely as a result of the many roads that have been closed off around the station, I spent at least ten minutes meandering my way around until I found an access route that was open - I should point out (as I have before)that we have no up to date road closure bulletins to help us. It's all down to guess work and potentially highway code-breaking self-navigation. The ambulance crew were already on scene, of course and they had come from further away. I couldn't find them at first but they wandered over to the car, patient-less and explained that the '18 year-old, collapsed in street' was in fact a drunken man who had decided to hurl abuse at them. They left him where he was but he followed a few yards behind and asked for directions to the nearest train station. He was given directions but he clearly hadn't received them in his brain, so he asked again...and again...and again. Eventually he wobbled off in the right general direction and we all left the scene before he fell down and we were required for real this time. This anti-climax was followed by a few more hours on station. It really was too wet for people to go out and get hurt. Boredom took hold and I went on stand-by for a while. The tourists were out in force in the West End - obviously they had decided, rain or not, they were getting their collective money's worth out of London. My next call was to an underground station for a 26 year-old pregnant female who had collapsed, feeling faint. She was sitting in a chair, with her husband and underground staff in attendance. She wasn't far into her pregnancy and there was no associated problem reported but she was putting on a huge drama for me. She wouldn't open her eyes, or speak to me. When I tried to take her blood pressure she made no attempt to lift her arm, forcing me to lift it up and keep it airborne myself. She was fully conscious and there was really no need for the floppy-doll act. The only complaint she had, according to her husband, was that she felt weak and tired. All of her obs. were normal and nothing was said that indicated anything serious going on. She hadn't been out of the house for weeks, which I found strange and this was her second pregnancy, so she knew the score. Unfortunately, she still wanted to go to hospital and the crew obliged, although by the time they had arrived she was miraculously much less floppy. My last job of the shift was to a 43 year-old male with an unknown problem. He was in the street outside a police station and a passer-by had called us for him. When I got on scene, the patient had his back to me and was leaning onto the rail at the entrance to the police station. The passer-by didn't know what was wrong with him but felt he needed help, so I approached and saw that he was crying. He was decently dressed and didn't fit the profile of anyone on the street, so I was a little taken aback. He was sobbing like a child and his cries got worse when I spoke to him. He was clearly distressed and kept making references to letting a lot of people down recently. The man had no coat on and he was soaking and cold. I asked him how long he had been like this and he told me he had been walking around for the past three days. I got him into the car. There was no need for an ambulance so I cancelled it but he did need help and I took him to hospital. It looked to me like he was having a nervous breakdown, so psychiatric support was required. All the way to hospital he cried - he couldn't stop. He was carrying a briefcase and had his passport with him. He also had a list on which was listed his friends and their phone numbers; across the top was written 'please call my friends for me'. When I got him to hospital, the staff recognised how depressed he was too and he was put into a room where he could be properly evaluated and hopefully treated. This was the second time in the shift I had felt the sadness of another. Five emergency calls; one ran away (!) and four required an ambulance. It’s always a relief after a heavy couple of nights to end the series of shifts with a slow one. First call was to a 30 year-old female who was fitting at a hotel. She was described as ‘hot’ and had been having a seizure for over five minutes. I arrived on scene with the ambulance just ahead of me and bowed out gracefully after asking if I was needed. One crew is enough for a job like this and it was a ‘hotel’ crew, so there was a paramedic in attendance in case any drugs were required. I accompanied the same crew to my next job; a 22 year-old male who had ‘overdosed’ on 18 ibuprofen. His agitated mate came out to meet us and described how the patient had taken lots of pills and was not happy about us being there. I thought we were going to have trouble with this patient. Inside the little flat were four people; the patient, who was sitting feeling sorry for himself, a young female who may or may not have been the patient’s girlfriend, the guy who had led us here and one other male - oh and a crying baby somewhere in the background. To be fair, they were all harmless and kind of helpful in a frantic, not forthcoming sort of way, so it was an easy job to handle. I did a few obs. but my colleague attended the patient. I got Control to contact the Poisons Unit for him so that he could establish what danger 18 ibuprofen posed to this young man. Personally, I didn’t think he had any real problems, especially after learning that his mate had given him salt water, induced vomiting and cleared his stomach soon after he had taken them. The pills wouldn’t have had any chance to become ingested at all. My colleague was told by the Poisons Unit that the greater danger was the fact that he had been given salt water. Too much salt can cause cardiac problems and so he was to be taken to hospital for monitoring. I asked his friend how much salt he had given him and he demonstrated by pouring a little into a glass. The glass would then have been filled with water. It looked like he had been given no more than a saline solution; very little salt. Nevertheless, he was taken to the ambulance. Well, I say taken, I mean he bolted down the stairs in an attempt to escape. His friends caught up with him and pleaded for him to go. I waited outside the building with the newly-captured patient and handed him back to the crew when they got down in the lift (I took the stairs – often quicker in these places). They took him aboard the good ship NHStaxi and left. I found out later on that he absconded the second he got to hospital. My personal opinion is that he is a little time-waster who, for reasons unbeknown to the rest of mankind, wants attention from his little gang…and gets it whenever he plays the suicide card. Our involvement makes his demonstration of pity null and void because we expose the reality of his good health, thus he runs away from definitive care. My only hope is that he has a job somewhere, doing something, so that his taxes cover the cost of his adventures. 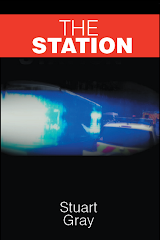 After a rest on station I went on stand-by and was called to my next job – an unconscious 25 year-old male. He was lying in the street outside a bar when I arrived. His friends were standing over him and one of them became very annoying over the course of my management of this patient. The guy on the floor loves to pop Valium, his friend told me. He also likes to take cocaine and ecstasy – he is a real party animal. That’s not all. He'll wash all of this down with a bottle of wine and some beers. The he will generally kick off, become violent and end up unconscious or arrested. All told, this gent lying in front of me is an all-round man’s man and everyone’s hero. I would love to have pulled a book of tickets out of my coat, written one up fining him £500 for the cost of the ambulance and served it to his friend. I did my obs., declared him unconscious and I listened to his friend going on and on about how he (the patient) had taken ten Valium before coming out, followed up with a line of coke (just one line, he emphasised), knocked back a bottle of wine, then went down the road to a bar where he caused trouble with the door staff. Now he was resting in peace on the pavement, awaiting his redemption. I protected his airway, monitored his breathing, which was changing and advised the crew when they arrived that his friend would be trouble. We got him into the ambulance and I set about getting his airway and breathing sorted. It had become quite noisy, so an OP was put in and that solved the problem. IV access was gained, Naloxone was given (just in case) and fluids were put up. His GCS was 3, he had pinpoint pupils and his BP was dropping. He wasn’t doing well. Soon he would lose all airway reflexes and intubation would be on the cards. Luckily, after we had spent ten minutes sorting him out, his condition improved a little. He was still unconscious but his vitals were coming out of the red. During the entire period in the back of the ambulance when all of this was going on, his little friend knocked on the back door repeatedly, asking inane questions and generally slowing us down. He wanted to know if he could come with us and if he did would the ambulance crew take him home again? I knew he’d be trouble. We left for the hospital without him. He was told to get a taxi. Not long after that, a panic attack in the street was resolved with relaxation exercises, provided by the ambulance crew who arrived after me. The young man had started panicking in his car and was wandering the streets. His breathing was rapid and he had all the classic signs and symptoms of hyperventilation. Not much we can do except to bring him back down to Earth. I spent less than five minutes with him and started the breathing exercises he needed. The crew completed the job on the way to hospital. My last call was for an assault in the same street as I had been in for the unconscious O/D earlier. On scene I found a Russian man with head injuries a crying woman with her boyfriend (on the other side of the street) and a couple of police officers. The Russian man had allegedly sexually assaulted the crying woman and her boyfriend had responded by punching his lights out. The initial punch or punches had given him a black eye. He fell hard to the ground during the assault and sustained a second injury, on the other side of his head, which was now bleeding. There was no difficulty establishing who did what here; it had taken place in front of the police officers, who just happened to be on patrol. Clear cut I would say. The Russian man spoke very poor English (or pretended to) and it took a while to establish what he remembered. He had been knocked out, according to the police officer, so his memory of events was understandably foggy. Either that or he wasn’t prepared to compromise himself. The only part of the incident that had been witnessed by the police was the assault on him…not the alleged prior offence. The ambulance took him away and I completed my paperwork. My last night shift was coming to an end. I received no more calls after that, so I got a bit of a rest at the station and got very bored. Just as well because the electrical system in the car is playing up again and the MDT keeps shutting down. Not fit for purpose. Nine emergency calls, one convey and one refusal. Seven required an ambulance. Tonight was going to be the busiest night of the year for me so far. The jobs were interesting and varied and a few of them took a while to deal with, so the shift went very quickly. It all started with a call for a 27 year-old having an allergic reaction at a local Hotel. She was part of a Hen group (you know I love those) and was about to go out with them for drinks and fun and trouble, no doubt. When I got to her room, she had a few friends around in various states of undress. I had to insist on covering my eyes ‘til they were all decent. Honest. She was covered in red blotches. She looked as if she had been 60% in the sun and 40% in the shade. It was a shame the rash was so uneven – she might have got away with it. Unluckily for her, however, she had reacted to something she ate and the blotchy erythema indicated an allergy that could get worse, especially if it affected her upper airway. She told me that initially she had felt a ‘lump’ in her throat. For now, though, she was breathing normally and had no signs of distress. Except when I told her she had to go to hospital. Then I saw distress. Her fellow Hens were gutted and said so…a few times. However, they bravely decided to go out and enjoy themselves in her honour. She was compliant and did what I asked; she knew it wasn't too serious and would clear up soon - that compensated for her missing the night out. Partly that and partly the fact that I told the her she would be in hospital for a few hours at most, would probably get a couple of pills and then she could join her mates. Her half-naked friends gathered around her (I continued to cover my eyes of course) and clucked (sorry) about everything being ok and that she wouldn’t miss anything. I got the patient and an accompanying hen to the car and off we went to hospital. En-route I came across a RTC and had to stop. Two cars were involved and the drivers were still inside them. The vehicles were in the middle of the road and I called out to one of the drivers to get out of his vehicle and stand on the pavement. This is how the conversation went. You’ll like this. Now, I thought he meant he couldn’t get out of his door, which was jammed into the other car. I didn’t have time to play games with him and I had a blotchy patient in the car. The word dumbarse springs to mind. Add it to your dictionaries; I’ll be using it more often in future, probably in conjunction with "I'm a"
I called it in and asked the patient if she minded. She said she didn’t but also added that she felt much better and wanted to forget about the hospital trip. I persuaded her to hang tight while I dealt with the RTC. I apologised again to the disabled driver and decided the best thing to do was to have the cars unlock themselves from the embrace they were in and then each driver could drive his vehicle over to the kerb. The police (now on scene) were happy to have that done and I knew an ambulance was nearby; I could hear the sirens not too far away. Both drivers were unhurt, although the driver of the car who caused the collision decided he might have neck pain. Here we go, I thought. 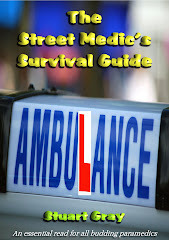 Once the ambulance was on scene I continued my journey to hospital. I had to reassure the patient that she would be going to the ball all the way there. I got her into A&E, handed over as usual and the nurse told me she would probably be put on fluids and tested and probed for the duration of the night. Oops. I need to avoid all hen groups until the dust dies down. The next call was to another allergic reaction. This time it was a 19 year-old in a Halls of Residence. She had a nut allergy and had no Epipen with her because she had not reacted for years but now her luck had changed. She was in mild respiratory distress and hyperventilating to boot. Her friends were anxious about her and her condition had the potential of deteriorating. There was a crew on scene with me and the paramedic asked me to give her adrenaline. I obliged – prophylactically, it was good idea. She started to settle down but she wasn’t out of the woods yet, so we carefully took her down to the ambulance for the short trip to hospital. I haven’t seen many miracles recently, so the next job made up for it. It was to a male who had fallen from a 7th floor window - at least that’s how it was given. I was asked to report for a Delta Alpha (doctor). Control will ask us to do this if the job sounds serious enough to warrant sedation or on-the-spot open chest cardiac work. I raced to the scene and found a solo motorcycle paramedic already there, attending to someone I couldn’t see on the ground. He had fallen from the window of a hotel room. The hotel is located less than two hundred meters from my station. There was a fence and hedge obscuring the scene, so I climbed up onto it and looked into the little crowd. I asked the paramedic if he needed a Delta Alpha. He didn’t answer but I saw the guy he was attending. He was lying on his back and he was talking, so that was a good sign. Maybe this wasn’t ‘as given’. I went around to the place where all the action was and came out onto a narrow little patio area where guests can sit and drink. I went over to the crowd, found out who was needed and got rid of the rest. I also had the little gate at the end of the patio opened up so that the crew could get access when they arrived. So, here’s the story. The guy, who is Australian, was very drunk. He walked into a guest’s room (who happens to be a fire fighter from the States), said something vague about not finding someone and continued walking the length of the room and through the third floor window, falling vertically 40 ft to the patio below. He landed on a metal table, which crushed instantly. Now he was lying on the ground, surrounded by worried looking staff and concerned paramedics, with nothing more than a scratched elbow! There’s no doubt the table saved his life. It broke his fall and absorbed almost all of the energy. Luckily there was nobody actually dining at the table when he fell from heaven. This young Australian was full of energy. I felt sure he had taken more than alcohol. He was buzzing. When I spoke to him, he shook my hand and our conversation turned into a Python sketch. “Na. I’m alright…look!” Now he was demonstrating his full range of movement. He looked at his elbow. Hilarious. I couldn’t help smiling all the time I was talking to him. He was boisterous to say the least and very alert. I thought he might have a head injury and it was being masked by the alcohol and possibly drugs. When told that his top would be cut so that we could examine him properly, he became quite angry and wasn’t having it. He told us he had just bought the top and there was no way he was allowing it to be cut. No way. The Delta Alpha was stood down and we had more than enough resources on scene to deal with him – we had two ambulance crews, the solo MC paramedic and me. He was difficult to get on the ambulance and stretched his arms out deliberately to stop us getting him into the back of it. He laughed all the time, joking at our expense. He had a collar on but he ripped that off in the ambulance. No use arguing with him, I thought. When he got into resus the first thing they did was cut off his top. He lay there looking very upset and suddenly very passive. I think it was sinking in at last. After that, I was off to an out-of-area underground station for a fall with a head injury. It was a typical escalator-type injury; teeth marks in the head, a little bleeding (but not much) and a drunken patient. I helped him until the crew arrived. He was embarrassed and eventually refused to go to hospital. Back to my patch for an acute severe asthma attack. 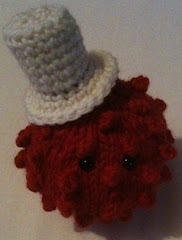 The gentleman had been having regular but unpredictable asthma attacks recently and tonight he was having his fifth. This time it wouldn’t resolve after he had taken his inhaler. This is known as brittle asthma. I helped the crew with the obs. and I left them to it. He was being nebulised and already felt better but he needed to go to hospital and get his medication reviewed. There was one thing I felt may have contributed to these attacks, however. He told us that he had been given Ibuprofen by his doctor. This drug, along with aspirin, can actually trigger asthma. No break yet and another trip to Leicester Square for a young female who was unconscious (drunk). I arrived to find a large girl lying on the ground with one of the local street urchins attending her. I should explain, the street urchin is a wheelchair-bound young lad who scoots about Central London helping people. He loves doing first aid and I have spoken to him on many occasions. On this occasion, he had taken all the basic obs and was very keen to stick around and help. I had to limit his involvement though; he was beginning to interfere with my job. I asked him to guard the car and guide the ambulance in. He duly obliged. I waited 20 minutes for the ambulance. Things were getting stupidly busy now. When it arrived, I found that I was talking to a crew from well out of our area. They picked her up (with a struggle) and bundled her in to the ambulance. No other way of doing it really. The next call was a ‘spiked drink’ job. Most of these are nonsense; the women are just drunk but can’t believe they are so out of their heads on ‘a few’ drinks. This time was different. This 31 year-old woman was not drunk – she was tripping. She had been at the bar of a club and had asked a man if the drink in front of her was his or not. It was the same drink she had ordered but there were two on the bar and she didn’t know which was hers. The man told her which one it was and soon after she drank it, she lost control. Her husband was with her, as well as a number of wailing friends. The whole episode took place in the basement of the club. It was dark, noisy and stinking. The patient was lying on a couch and I tried to find out how she felt but she was confused and made no sense. At times she was lucid but more often than not she was ridiculously out of it. I suspected she had been given an amphetamine, probably methamphetamine. Ecstasy couldn’t explain all of her signs and symptoms. Initially she was just nauseous but as time went on (I was with her for an hour before I got an ambulance, despite asking the club staff to make it clear I needed one urgently) she began to develop other, more sinister signs and symptoms. She began to have short seizures, lasting up to a minute, followed by periods of apnoea (no breathing), which required ‘bagging’ to remind her to breathe. This resulted in a gasp of breath (usually after squeezing the bag three times) and her return to the living. I had to carry out this procedure five or six times and her husband was becoming seriously concerned. I had done all I could; oxygen, IV, fluids, all my obs. I had nothing else to offer except to keep her breathing when she stopped. No drug would be of any value in this situation. She needed to get to hospital as soon as possible. She just happened to be genuinely in need at the worst possible time. When the crew arrived, I was relieved. We got her up to the ambulance with a struggle and we entered the outside world to the sound of sirens all around us. Someone had been stabbed in Leicester Square and there were police (some armed) running around and emergency vehicles blocking up the roads. It was 5am and we had a traffic jam. I was half way through my paperwork for this job when Control rang me and asked if I could go on another. So off I went to yet another drunken, non-responsive female in the street. It was her 19th birthday and her friends were with her. During the time I spent with them, waiting for the ambulance, completing all my obs and chatting, they busied themselves by taking photographs of their young friend on the ground. That’ll teach her. I got back to my base station and thought I might get off on time but I was given one more for the road. I thought it would be straight-forward. The call was for a male on a bus who was ‘not responding’. You know this is a drunken bloke who just needs to be woken up and thrown off the bus. So did I. When I got there the bus driver attacked verbally me. He wasn’t happy to have been left with his “life at risk”, as he put it and so I was in his firing line the moment I stepped out of the car. It was too late in the day for this and I retaliated, which he didn’t expect. I think he thought, as a public servant, I was going to take his abuse and grovel apologetically. He thought wrong. I told him to back off, leave the bus and let me do my job. He shut up and he left. The man was slumped in the back between the seats. He was completely unresponsive, except when I induced pain – then he would clench his fists and open his eyes a little. He did this a few times and I felt uneasy about him, so I left him alone and got Control to call the police. The bus driver came back and apologised and I learned that he had been trying to get the man out but he had just smiled at him. I told him that it was best to leave the man alone because he was probably violent. The bus driver was confused as to why I might think such a thing. The police arrived (but not the promised relief ambulance) and they got him off the bus by physically dragging him out. I checked him further and asked the police officers to sit him up against a wall. The man suddenly launched a tirade of abuse at us, especially at the police. He used racist comments directly in the face of the black police officer (who was much bigger than him) and swore generally. He spat at us and refused to get up and move on. I told the officers that there was no way he was going in an ambulance and they agreed. They tried to reason with him and I must say, I’m impressed with how calm and professional those two officers were, but he just wouldn’t play ball. They arrested him and cuffed him. He was so strong that I had to help restrain him while they got the cuffs on. Well, I had nothing better to do. When I left I watched as the man kicked his leg back, catching one of the police officers in the shin a couple of times as they pinned him to the wall. He wasn’t going anywhere quietly. Eight emergency calls, one non-convey. Seven required an ambulance. First call of the night was to a RTC on a busy one-way street. When I arrived the casualty was sitting against a post with bystanders helping him out. He had a head injury which had bled quite a bit but was now under control. The witnesses (and there were a lot of them) had seen him attempt to cross the road, step into the path of a car and get hit, throwing him into the air. He landed, head first, on the road. Then he got up and staggered over to the pavement, where his helping hands gathered around him. This little collision was his own fault - he had walked in front of the car and it should have been as clear cut as that but, of course, it wasn't. The driver and passenger of the vehicle carried on, went round a corner, parked up and legged it. Why on Earth would they do that? It was now a hit and run and they both faced criminal charges as a result. The ambulance arrived and took care of the patient, who was suffering concussion and not much else and I went to look at the car so that I could get an idea of the force of the collision. I walked to the street where it was parked and a number of witnesses, including taxi drivers who had tried to stop the pair running away, were milling around. The car involved was one of those smart car things - you know, park anywhere; put it in your pocket when you're done. There was slight damage to the front of the vehicle but nothing significant, which is always good from the patient's point of view. I wondered why the driver and passenger had run. Was the car stolen? Would anybody steal a smart car? No offence if you own one. Did they have drugs on them? Had they been drinking? Now they are in serious trouble. Before they ran, they had nothing to fear. My next emergency call was for a 49 year-old male who was 'not alert'. I located him in a couple of minutes because he was in the next street. He had a couple of concerned looking people with him. I walked up to him and decided he had been asleep. Meanwhile, 999-caller man is looking rather sheepish and apologising. The man was basically on the street, had been up all day and evening selling The Big Issue and was waiting for his usual pitch to clear so that he could get a sleep. Unfortunately, his usual pitch was the doorway of a busy theatre, so he had to wait until they had shut, probably another three hours off. All he wanted to do in the meantime was sleep on the pavement. However, the good people of London town will simply not permit this and will, in good conscience, call us out every two minutes until we realise that they just can't deal with the sight of sleeping people in public places. The term 'not alert' usually means they have called out softly to the sleeping/drunk person from the other side of the street and (strangely enough) he or she has not responded. I had intended to visit this man later in the shift and check on him but I never got a chance. During my stand-by on Leicester Square I noticed two rather large women walking behind their pedi-cab (a taxi bicycle), from one end of the Square to the other, just to climb back on at the other end. These vehicles are not allowed to cycle across you see, so fare-paying passengers have to get out, walk alongside their taxi and then get back in. They probably had only a few hundred yards left of their journey to go. They could've walked the lot and had a few quid left for more alcohol. You see, I'm always thinking of others. 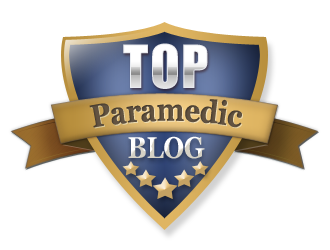 My next call shook me out of that daze and I went to the aid of an abusive, vomiting drunk who, as luck would have it, was already in the back of the ambulance when I arrived. I copped out by asking the crew if they needed me and go the much expected reply, "no". So I left with my uniform still clean. However, I wasn't to be let off that easily and my next call, immediately after this one, was for a 'male, lying in street, unresponsive'. Here we go, I thought. I hunted for this man for a few minutes. I did an area search. I called it in and thought about a 'no trace'. The ambulance arrived and the crew couldn't find him either. Then I spotted him on the other side of the road. There were a number of people in their cars pointing him out to us. We looked sharp and on-the-ball at that instant, I can tell you. I went over to him and gave him the customary shake and shout. He responded but wasn't pleased. He was drunk and, surprise, surprise - Scottish. The crew joined me and we stood him up but I could tell he wasn't going to stay that way (up that is). We asked him to move on because he was just drunk but he refused. My colleague very kindly offered him the opportunity of going to hospital to 'sleep it off' but he became abusive and swore at her. So that was the end of the NHS-nice act, I can tell you. He stood (wobbled) his ground and said the strangest thing. "I need to go to hospital"
He went on to shout that we didn't understand Scottish people and that he was a true Scot. I pointed out that I was standing right next to him, was Scottish and that he did not represent me or my nation. So he went in a huff (as we say). We started him on his way and he took three steps before wobbling and falling on his face against a corrugated iron shutter. He slid down this in a most undignified manner and lay there feeling sorry for himself and rubbing his sore head. I had a pang of sympathy. I really did. My colleague had called the police for him and they arrived to send him on his way. The ambulance left and I drove a few metres down the road to complete my paperwork. I should have driven further. One of the police officers came up to my window and asked if we could take him. He was drunk and incapable (we knew that) but the police don't deal with that any more. I had to call the ambulance back and elicit a promise from Mr True Scot that he would behave and apologise to my colleague for the abuse he had given her. The ambulance returned, he apologised and he behaved. Off he went to bed. After a rest and a coffee I was off to a job in the City, where an 18 year-old was so 'ethanoic' he couldn't move. He was on the deck (literally) of a boat Quay, where he had fallen down stone drunk. He was a guest at a party for a girls' school and there were a number of 'supervising' teachers there too. The teachers were all sober. The pupils were mostly drunk. One of the girls had bumped her head and was bleeding and crying when I got there. I dealt only with the drunk lad though - she was fine. The ambulance crew arrived to help me get him off the Quay. It was a tricky, bumpy ride in the chair for and became more alert as the short journey progressed. He was wide awake by the time I left the scene. A call to a male who was lying in the street turned out to be a bit of a mystery. The caller had stated he may have a neck injury. I arrived at the same time as the ambulance, crewed by two officers, so they started the assessment of this patient. He was lying flat on the pavement, complaining of neck pain. There was a bit of blood around him and I looked to see where it had come from. There were deep scratches down his left arm - they looked like fingernail scratches in fact. The blood had come from them and because there was no blood anywhere else around him, it was clear he had sustained this injury on the spot. The crew collared him and put him on a 'scoop'. Personally, I didn't think he needed it. He had good movement, sensation and his story made no sense. He claimed that he had just been walking down the street and then woke up like this. There were lots of people around and none of them knew what he was talking about. The crew were being cautious. When we got him into the back of the ambulance I asked him if he was a self-harmer. He was vague with his answer, stating that he "used to be". This gave me a profile already and I have to say I didn't believe anything he was telling me. I asked him if he had been fighting with a woman tonight. He took offence but his scratches had been caused by strong nails and not many men have nails long enough or strong enough to cause an injury like the one he had. The police were now on scene and the whole thing was going nowhere. His story was inconsistent and he was absolutely miles away from home. I think he has been in a lot of ambulances. Later on, I was called to a 62 year-old male with chest pain and DIB. When I arrived the crew were behind me and so we all went in together. The man was standing at the door waiting for us and he did indeed have DIB. His sats were very low and he had a cardiac history. He was quickly nebulised (this cleared the wheeze) and blued in to hospital. My last job of the night shift was for an 18 year-old female who was 'not responding'. The call came in at about 5.30am and originated from an estate in south London. When I arrived in the area, I noticed a police car passing by - the officers were looking at me and they seemed puzzled. I got on scene and the police car drove up and parked next to me. The officer asked me if I had been cancelled for this call (they had been dispatched to the same address) and I told them I hadn't. I thought it was strange that they had been called at all and I asked them to stick around. I had a feeling about this one. Together we went up to the flat and were met by an agitated elderly man who spoke no English. He led us to a bedroom where a young girl was lying - looking dead. Her mother was shaking her and crying. The girl was completely lifeless. The flat seemed full of people; the brother was there (he spoke English) and the father and an Aunt were all in the front room. The brother had come in and told us that she was sleeping and she suddenly coughed then became unconscious. He tried to wake her but she did not respond. The brother, I should point out, sleeps in the same room. I asked the mother to let me near the girl and she relented. I tried for a response and got nothing, she was floppy, her mouth was open and she looked gone. Then I manually opened her airway and she moved her head because it was uncomfortable. She was faking. I told everyone to clear the room and I was left with the police officers. I told the girl that her family were no longer in the room and she opened her eyes but she still refused to speak. She closed her eyes again and ignored me. She had wet the bed and I asked the family about this. Her mother said she did it all the time and that it was normal. Then her brother said that she had never done this. It was all becoming a bit strange. I started checking the girl's vital signs and blood sugar level. Everything was normal. I asked her again what had happened and she refused to speak. She opened her eyes properly now and I convinced her that I was there to help. I looked at her and I felt something was very wrong. I asked her some pertinent questions. "Do you need the police?" That was it. I asked the police officers to stay with her and chat while I left the room. Something was wrong here. The crew arrived and I explained the situation to them. Then, after five minutes, one of the police officers came out of the room and stated that she had told them she had eaten grass earlier that day and he asked me if that was likely to cause this problem. I looked at him and wondered what was going on. I told him that I found the idea ridiculous (as did he) but that, yes, if the grass had been treated with something, like weedkiller, she could have respiratory problems but it didn't make sense in this case. She hadn't vomited and she had no other physical problems. I went back into the room with the crew and I examined her mouth. Her tongue was red and damaged. It looked to me as if she had bitten it or something had caused trauma to it. For the record, I had my suspicions but they can't be printed here. The girl was eventually taken to hospital with the crew and a police officer. More police were asked to attend and they stayed with the family. Interestingly, the girl refused to have anyone in her family accompany her and later denied the whole 'grass eating' story. I've noticed that only a proportion of you vote. I think there is still a fear of identification. Rest assured, the Google map is mainly a bit of fun and cannot identify your address! Sometimes it doesn't even identify your vote. Please get involved with the voting, it gives me a unique record of your opinion (or will do when I start asking pertinent questions). If you are a Community type person, why not join mine? I've seen a few names visit and not sign up. The Community gives me (and you) another route for communication and can be very useful. This doesn't identify you either, so don't be shy! One other thing. I have been persuaded that, in the interests of openness, honesty and accountability, I should consider fully identifying myself. My colleagues already know who I am, so the pseudonym is moot and I'm now mulling over this prospect. I'll keep you posted. Thanks for all your emails and comments to date. Please forgive me if I don't get back to you straight away. Seven emergency calls. One non-convey and six requiring an ambulance. A Red2 for someone with food poisoning, described as 'semi-conscious'. You mean her eyes were closed? There was already an ambulance on scene when I arrived so I wasn't required. This was followed swiftly by a call to a 26 year-old male who had been knocked off his motorcycle by a taxi. He was sitting inside a building society when I got on scene - he was chatting to one of the staff and waiting for me. The incident had taken place some 30 minutes earlier and the taxi driver was nowhere to be seen. Meanwhile, the patient had hobbled inside at the behest of the nice lady who was now offering me (and the police officer who had just arrived) a cup of tea. There was nothing really wrong with this man. He had fallen awkwardly on his ankle and now it was hurting him. The taxi driver had allegedly told him it was his own fault and carried on about his business. He hadn't even stopped to help the poor guy up off the road. I did my usual baseline stuff and he declined to go to hospital. I got him to sign my magic form and then I left him to explain the incident to the police officer. It was raining all day today and the roads were slippery. I left the vomit-smelling car at the station to air out and took my usual vehicle, complete with new battery, onto the slick surfaces of London Town. I was driving with extra caution. After a bit of a pause, during which I searched for my stethoscope (it disappeared from the top of my bag), I got a call to a G.P. surgery for a 44 year-old male, DIB ?cause. The job was out of my area but I was familiar with the territory because I used to work in it a few years ago. I went into the surgery and waited for the receptionist to acknowledge me and let me through the security door to the doctor's office. Inside, a large man was sitting on a chair with an oxygen mask on his face. The nurse was there with the doctor and they told me that he had come in complaining of having shortness of breath (SOB) and chest pain (now gone) over the previous weekend. He looked fatigued and was certainly out of breath. I checked his oxygen saturation and it was low. I listened to his chest and I checked his ankles and hands for signs of swelling. The doctor was suspicious of heart failure and I had been thinking the same. He had some kind of cardiac problem and his pump wasn't behaving itself. He could collapse at any moment. The crew arrived as I was gaining IV access and completing the rest of my checks. They wheeled him out to the ambulance and carried out a 12-lead ECG. This gave us a good look at what his heart was doing (or not doing). It looked like he had a block and other anomalies which went some way to explaining his present condition. I took a copy of the ECG back into the surgery for the doctor to have and left the crew to get on with delivering the man to hospital, where he really needed to be. I continued my search for the elusive stethoscope after that. I thought I might have left it in a patient's house but I couldn't remember the last time I took it out and used it. I know it was recently but I just couldn't pin down the memory of the location. I had lost a stethoscope before when I left it in the back of an ambulance but this tends to happen, especially during difficult or messy jobs - things get left behind. It was my favourite steth and I had a cheap one in my pocket as a substitute - it didn't feel right. I stood in the rear area of a large department store in Regent Street for 15 minutes. I stared at a lift door, waiting for it to open. I was bored and a bit annoyed at being left here. There was a patient somewhere in the building. He was vomiting, had DIB and did not want the rest of the staff to know, so he was hiding himself away until the ambulance arrived to take him quietly to hospital. He hid himself so well that the staff member charged with taking me to him couldn't remember where he was. So I stood by the lift while he went on a search for his missing boss. Meanwhile, the crew had arrived and were sent up the escalators. They were steered a long way off and I couldn't contact them. This was beginning to look like a farce. The 'guide' came back for me and apologised. The lift opened but nobody was in it. He looked upset and decided to take me to another part of the building where the patient was supposed to be (he was supposed to be in the lift). I walked all the way to the other side of the building, went up some stairs, around a corner or two and we still couldn't find the patient. Eventually, 25 minutes in, I went back to the shop floor with my trusty guide and called Control to ask where the crew were and if they had seen the patient. After a short investigation on the other end of the line, I was told that the crew had left with a patient on board. If I had been holding a biscuit, it would have been snatched from my hand. Near the end of my day and a very interesting job arrived on my MDT. A 16 year-old female was having a fit in a theatre. I got there as fast as I could and parked up beside the ambulance which was already on scene. I had to ask for directions because this theatre is a maze and, for a few minutes, I couldn't locate the crew or the patient. Finally I found them in the basement. A young girl was thrashing around on the floor and the ambulance paramedic and a solo motorcycle responder were trying to control her. The paramedic told me that she had a specific condition but I hadn't heard of it before and wasn't sure what we were dealing with. It looked like epilepsy but the girl was fully aware of what was happening and had already refused to have rectal Diazepam administered, which is the normal first step in such cases. Getting a line in would be a challenge - every muscle in her body seemed to be fighting with her. She had already been given some of her own meds. by her teacher, who was with her, but it had no effect. She had oxygen on and was put into a chair, albeit with some difficulty. There wasn't a choice - she had to be carried up a lot of steps to street level. She had been like this for almost 40 minutes when I arrived and so it was imperative that we got her out of there. The second crew member arrived to assist - he had been getting more equipment to the scene - and together we got her up the stairs and out of the building. As soon as she was in the back of the ambulance, we got started in earnest. I put a line in and gave her Diazepam. The effect was almost instant; she calmed down and her breathing slowed. It slowed so much that I was concerned about her initially but she was fine and was able to talk to the crew. For some reason another crew had been sent and so there were two ambulances, a car and a motorcycle on scene - a total of 6 LAS staff. Somebody is being very cautious. The girl had another seizure a few minutes after the Diazepam had been given. We had her on a glucose drip because her blood sugar levels had dropped (no wonder with all that exertion) but she still wasn't stable and this had been going on far too long now. She was rushed to hospital and I accompanied the ambulance - well, I drove in front and cleared the traffic, which is a lot easier to do in a car than in a large ambulance. At the hospital she was given more Diazepam and settled down again. I found out that her condition is called Propriospinal Myoclonus. It's quite rare - so rare in fact that I could only find a few relevant links for it. In this patient's case, I understand the origin of the problem is childhood disease but I wondered if I had seen this before without knowing it. I dealt with a young man having a mysterious seizure in a wine bar last year (you may remember). He too could communicate and seemed to be fully aware. His spasms also seemed to be jerky and muscular in nature (myoclonic). It had me thinking. After that job I was asked to attend a young man who felt ill at work. All of his obs. were normal but he insisted he felt faint and dizzy. When the crew arrived he asked for a brain scan to be carried out. I think we explained to him that the ambulance was out of brain scanning machines at that time of day. I volunteered myself for the last call of the shift. It was near to where I was located and very near to my station, so it would be a handy call to finish on. 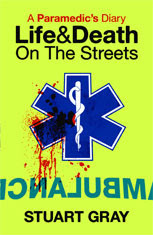 There was a drug addict lying in the street and the motorcycle responder was dealing with him. A passer-by had called an ambulance for him because he appeared to be having a seizure. I thought I might offer my assistance with this one. Fitting drug addicts can be a handful, so my colleague may find the extra mittens useful. Control allowed me to go and help. It took me 20 seconds to get there. My colleague was talking to the man, who was jerking on the pavement but managing to chat. It seems he bought some dodgy stuff from a 'bloke in the street' and was now paying the price. He wasn't in any real trouble - he was mainly obnoxious and difficult to deal with and I felt no sympathy for his situation to be honest. There are plenty of people out there who really need our help and who don't abuse drugs to excuse themselves from responsibility. I waited until the ambulance arrived and then I went home. I found my stethoscope. It was wrapped around a bush in my garden at home. It must have snagged and been pulled off the top of my bag as I went to work a few days ago. It got coiled around the bush and looked like a snake. I am currently drying it out and will have to strip it for spiders. Four emergency calls, all of them requiring an ambulance. You can probably tell it was a quiet day today. At first I wondered what was going on. Was it the rain? Was it yet another half term for the kids (but then it would be busier, wouldn't it)? Was it that Londoners had finally learned only to call ambulances out when they were dying or very close to dying? I had hours to ponder these questions during my shift. The amber car is no more - they are sending ambulances to green calls instead of letting me suss them out. I am one of two cars working on all red calls, sometimes amber but mostly red. There are now at least two motorcycle responders, also dealing with red calls and the ambulances are answering these 'Category A' calls too, so it's little wonder that the combination of miserable weather, the drop in numbers of people around and the higher level of emergency cover had contributed to me sitting around doing nothing most of the day. Not that a rest is as good as...a rest. I'm fine with it but I get bored if I'm not busy. My day goes much quicker when I am running from one call to another. Everything slows down when I sit and read or watch TV. My first call this morning was to a hotel I didn't even know existed. A very posh entrance led to a very posh room. You can tell five star luxury when you can swing a fat cat on a bungee around the room and still not connect with the walls (not that I would advocate using a cat in such a way - not on a bungee anyway). I was attending a 91 year-old who had fallen and possibly broken a rib. We call this type of fall, where a simple trip is involved, mechanical. When I went into the room, he was in bed and I asked his name. There were two women in the room with the man and one of them gave me his name and I recognised it immediately. I also looked more closely at the man and realised it was indeed who they said it was. He is a world famous and well respected American TV journalist and anchorman. I grew up knowing the name without knowing who he was and what he did but I know he is synonymous with honesty and truth in the USA. In fact, it is said that more Americans trust him than they do their own Government. I felt honoured to meet him. Obviously I can't name him but some of you will probably guess. Keep it to yourselves. He had fallen hard onto the corner of his bedside table and was battered and bruised around his abdomen and ribcage. Otherwise he was stable and in good spirits. I chatted to him until the crew arrived and we carefully moved him onto the chair and out of the hotel to the ambulance. He was still cracking jokes and asking about the possibility of there being pretty nurses at the hospital when I left him. A thoroughly nice man. There was a lull in my proceedings and then a call for an epileptic at an office had me on my wheels again. An ambulance was already on scene and I went up to the second floor to find the crew attending a young female who was post ictal and recovering from a fit. Nobody in the office knew she was epileptic, it was a revelation for them. It's a good idea, if you are the duty first aider for your company, to find out who suffers from what so that you can report this to us if we are called and so that you know what you are dealing with initially. I assisted the crew but had nothing to do otherwise - they had it all under control and the hospital was just around the corner. I left them to it and set off on my next call - a 91 year-old female (two 91 year-olds in one day?) with chest pain. When I arrived at the G.P. surgery where she had been attending a routine appointment, the crew were walking her out the door. She didn't have chest pain, she had abdominal pain and it was better now apparently. She seemed like a nice old lady and the EMT attending was getting along well with her. I think you have done very well in life to reach the age of 91 and still be going to your G.P. for routine appointments! She walked there herself incidentally. During the rest of my shift I got a large number of cancelled calls. The consequences of living with FRED are beginning to drain me and my colleagues on the other FRU's and bikes (and cycles). One call after another will get you running on blue lights and sirens then they will be cancelled by the system because there is a 'nearer vehicle' or it was 'sent in error'. whoever developed this system had no idea of how it was going to affect the people at the sharp end. It is extremely stressful to start and stop like that throughout the day and, for your information if you are reading this, it slows our response to calls. I have now become so used to being cancelled that I actually wait for a little longer before I set off on the job. Invariably, I will still get cancelled but it has become a stupid lottery. Other road users are being put at considerable inconvenience I think. It got to the point that I was radioing in to ask if they really wanted me to run on this. That's a good 30 seconds wasted if I am required. Two calls that were cancelled had the additional element of illogical idiocy in the descriptions. One was for a 'sharp leg pain' and was given as a Red3 simply because the patient had answered YES to the question "Do you have difficulty in breathing?". The second call had an address that gave a street name and included, 'London, England'. No postcode. It should be hilarious but it isn't really. Rant over. Half way through this shift my vehicle's electrical system failed and my MDT gave up on me. All morning I had been getting beeped whenever my speed went over the legal limit for the road I was on. For some reason, the built-in speed warning system had been switched on. Ironic when you consider how many times I was going to break the speed limit today. It became annoying after a few hours and I couldn't work out how to switch it off without a hammer. I took the car back to the station to be fixed - apparently it had the wrong type of battery in it! I took another car out but it smelled badly of vomit. I scrubbed and scrubbed the inside but I just couldn't get rid of the pong. I kept the windows open for the rest of my shift, rain and all. Later on a colleague explained to me that he had tried for two hours to get rid of that smell after a patient had thrown up without warning. My final call came in at the end of the day, so I was happy to run on it knowing that I would be back on time. It was for a male suffering chest pains at a petrol station. I sped right past the place. I just didn't see it. What I did see however, was an ambulance coming in the opposite direction. I figured they knew where they were going so I turned around and followed them. They were lost too. Our MDT's were sending us into the wrong street. Luckily, the petrol station was visible around a corner and we both arrived at the same time. Drama. There was a City of London police officer on scene and he chatted to me as the patient walked himself (chest pain free) to the ambulance with the crew. City of London police carry defibrillators so they can start CPR and give the first set of shocks if required before we arrive on scene to take over. This young officer was telling me all about the new defibrillators that had been issued. He also let me know that he didn't know how to use it. I showed him and he was suitably grateful. Ten emergency calls. One refused, one hoax and one conveyed. My last night shift. Again, I am on a call before I have time to complete my VDI. I race off to a female having an asthma attack and find a woman in her thirties lying in bed, wheezing and struggling to breathe. Her boyfriend is with her and he tells me that she has been like this all day, on and off. She demands oxygen before I can ask her name and repeats her demand as I carry out my baseline obs. The clever people in management want me to carry out peak flow (PEFR) tests for every asthmatic before I start treatment, yet clinical common sense demands that I do something for the patient. I can only ever do a PEFR test if the patient is calm enough and stable enough to manage it so I decide to start the woman on nebulised Salbutamol, after detecting a wheeze in her chest. I skip the PEFR. By the time the ambulance crew take her to hospital she is a lot better. I complete my paperwork and try to do a bit of a VDI but it is all in vain. I get a call to a male with chest pain a couple of miles away in the other direction (of course). I arrive, get confused about which block of flats might be the correct location, reverse, look again and am prompted to re-locate by a pair of waving arms from a balcony - could have been washing flapping on a line for all I could see in the dark but luckily it wasn't. I made my way up the stairs and into the small, cramped and full-of-people flat. The man, in his 60's, was lying in bed complaining of chest pain. He looked very pale and had been like this for hours apparently. I asked him my standard questions, which always start with "what's your name?" and I carried out my basic obs. He wasn't well and I prepared him for hospital. The crew arrived and the chair was readied for the man to climb into but he refused to go. In fact, it took us (and his family) more than 30 minutes to persuade him to go to hospital. In the end, we had to carry out a full 12-lead ECG at his bedside, show him how badly damaged his heart was and explain to him what the consequences were of staying in bed before he accepted our offer to save his life. He was probably just scared or stubborn or both. Or stupid. After that job, I got a chance to complete my vehicle checks and, luckily for me, the wheels of the car were properly attached and there was air in the tyres. Technically, you can refuse to start your shift until a proper VDI has been completed but it rarely happens. A 16 year-old who was drunk and had fallen (almost into the river) was already being treated by the crew when I arrived on scene so I was not required. I turned around and headed back the way I came but was dragged the other way for a woman at a train station who was feeling sick and dizzy. I was comiserating with her in my head. I arrived to find the British Transport Police on scene and attending. They explained that the young woman was about to travel and had suddenly collapsed, feeling ill. I spoke to her at length about her medical history and how she felt now. There was another woman there and she sat next to the patient and asked probing questions every time I said something relevant or pertinent. She was beginning to annoy me to be honest. A proxy conversation. Very strange. The crew arrived and I explained the woman's problem. Then the police officer took me aside and commented on the other woman. He made a statement that shot a light through my feet which ended up as a glowing bulb above my head. I turned back to the women on the bench. My colleague was already discussing her personal details. I apologised to my colleague and interrupted. "Is this lady actually with you?" I asked the patient. "No" she replied, "she just stopped to help." I turned my attention to the other woman. "Really", she responded with a shocked look on her face, "can't I stay?" "Can I just sit here then?" Hilarious. This lady had absolutely nothing to do with the patient but she presented herself as if she was one of the family! She even asked questions and led the patient to reply to some! There was a lot of eye rolling going on during that exchange, let me tell you. I spent a pleasant 20 minutes chatting to my colleagues (and completing my paperwork of course) before greening up for the next episode of the shift. The next drama was a call to a male, fitting in the street. The area I was going to is a known haunt for foreign (mainly Polish) alcoholics, so it was fair bet that it would not be an epileptic seizure. I arrived to find a group of people gathered around a man who was jerking and flailing on the ground. A young girl was holding him down. This little group comprised two members of the public, who had stopped to help and three or four fellow Polish alcoholics. Right from the start I could see the man was putting on a show. It was the most pathetic parody of epilepsy (or any other kind of seizure) I had seen in a while. It also made me a little angry because there would have been genuine epileptics out there waiting for an ambulance whilst I baby-sat this drunk until an ambulance arrived. I tried reasoning with him, telling him that I knew what he was up to and that he may as well stop thrashing about and putting me at risk from his loose fists. I told him he would get his hospital bed, so he didn't need to carry on the pretence but he had an audience and he had to keep them convinced. He didn't respond because, apparently, he couldn't speak any English. His friends weren't happy with my conduct and in between swigs of extra-strength lager they protested his innocence. Let me be clear. I was never rude. I was strict and stern. I was not about to be thumped by this man's stupidity in the street and I cannot tolerate time-wasting fools. The crew arrived and we bundled him into the ambulance and that's where he recovered miraculously. He stopped flailing, he stopped moaning and, oh prize of prize, he suddenly discovered he could speak English. He still wanted to go to hospital...for a bed. The crew reluctantly obliged. I will try to remember this man's face. Next time, the police will be with me. Then a 27 year-old female suffering an asthma attack at the bottom of the escalators in a tube station. It was pouring with rain outside so I was glad of the warm, dry environment. That, unfortunately, was the cause of this lady's discomfort. I nebulised her (after a failed PEFR attempt) and she felt a little better but she had a persistent cough and she probably needed steroid treatment for that, so off she went to hospital. I saw her later on and she had fully recovered. A pleasant woman who thanked me for my help, which was nice. Each time I tried to replenish my bags (oxygen masks, nebs, etc) I got a job. I was running out of stock in the car. I made my plea to return to station and I got all of two minutes to re-stock before they called me again. Another asthma attack, This time a 60 year-old at home. All she needed was a neb and she was happy. Her normal at-home treatment consisted of nebulisation and rest, so that's all she wanted from me. She was packed and ready to go on holiday and refused to go to hospital, despite my advice. She signed my form, chatted for a LONG time about stuff I couldn't keep my brain focused on and then, backing up to the door, I made my politest exit (escape). I was glad she didn't go to hospital - she talked a LOT. A quiet few hours followed and I went back to my station to recharge. I got my break during this lull and took advantage of the chance to eat some food...and chocolate. A call in the early hours to an 18 year-old with a head injury after a heavy, stock-laden cage toppled over on a ramp, falling onto him. His nose was bleeding and he had a bump to his forehead. He felt dizzy but he had not been knocked out and he had no neck pain or other associated problems. I took him to hospital in the car. The next call was to a 60 year-old man who had somehow twisted and ? dislocated his knee in bed. He may have moved awkwardly and pulled his knee cap out of place but it was an unusual job. Together with the crew, I helped keep his pain level down and he was gently moved onto the chair and out to the ambulance. He refused IV pain relief, so it was all achieved with Entonox, which seemed adequate for him. My last call of the shift was to a 30 year-old male who had been shot at an underground station in South London. I was given an RVP (you know how I love those) and warned not to go near the station in which the shooting had occurred. Of course, I drove right up to it because I didn't have a clear RVP (which was changed half way there) and I didn't know the area well enough to circumnavigate an avoidance route! Luckily for me and all else concerned it was a hoax. No shooting, no victim and no real danger. Just one out-of-place paramedic and ten or so armed-to-the-teeth cops. They smiled at me in pity. I left with my car's tailpipe between its tyres. There are some shifts that shake you out of your comfort zone and test your ability to remain calm and make the best decisions possible for the benefit of the patient. Tonight was one of those shifts. I was just about to start my VDI when I got a call to a 6 year-old male, fitting. Control called me on my 'phone and apologised for the distance they were sending me but, at that moment I was the only paramedic available and near enough to deal. That's always an ominous statement. I sped through rush hour traffic and got one scene, over four miles away, just outside the required Orcon time. In other words, I was late. I grabbed my bags and headed towards a door which was open and being guarded by a little girl. She had been sent to ensure I went to the correct address. She said nothing as I walked past her and into the flat. Inside, a woman was kneeling on the floor, 'phone to her ear, looking down at a little boy who was on his side, writhing and shaking. He was clearly having difficulty breathing properly and his airway was very noisy. The woman handed me the 'phone as I put my bags down and assessed the situation. The call-taker from EOC was on the other end and, as I unpacked what I needed she confirmed my presence on scene and I asked her when I could expect an ambulance. I made it clear that I needed it quickly. She told me that one was on its way but I didn't get an ETA, nor did I remember to ask her not to have the call downgraded or over-ridden by a higher priority whilst the crew were en-route. This call was originally given as a young male fitting but the updated information stated that he was no longer having a seizure and was simply 'hot'. As I rushed to get there, I instinctively thought that this would be another run-of-the-mill infection and temperature-related fit. In other words, non epileptic and likely to end with me assessing a conscious and lively (albeit hot) child. I knew the ambulance crew would be thinking the same way and I hoped that the tone of my voice held enough information for an experienced call-taker to recognise that I was dealing with something serious. I immediately began my primary assessment; his airway was noisy, so I adjusted his head position manually and that improved things a little. His sats. were extremely low; 78% and so I put him on oxygen. His pulse was racing at 142 and he was hot to touch. He was in spasm, especially around the diaphragm and he was completely non-responsive. Given the initial call information and the history, which was related to me by his mum, there was a possibility of status epilepticus and I was not about to take the risk that it might be anything else at this stage, so I administered rectal Diazepam. The boy's status did not change and his breathing was now causing me great concern. He was becoming flaccid, except for his Phrenic spasms and his sats. were only improving marginally to the mid 80's on oxygen. I knew I had to get him to hospital without delay. His mother told me that he had been like this for 20 minutes and that she had considered getting a taxi to hospital. After what seemed a lifetime, the crew arrived and I wasted no time in getting him into the back of the ambulance. The two EMT's on the ambulance worked around me as I cannulated the little boy and considered another dose of Diazepam but something wasn't right with this. We set off on blue lights and I asked the attendant to put a nasal tube in. The child's breathing had now become much noisier and he was clenching his teeth - trismus. There was a problem with his brain. His breathing began to deteriorate, despite his airway being improved by the nasal tube. He wasn't breathing adequately enough and so we 'bagged' him and prepared to resuscitate. All the time I was reaching over to the mother, who was travelling with her daughter, to comfort her and reassure her as best I could. When we arrived at hospital, the boy's condition had deteriorated significantly. 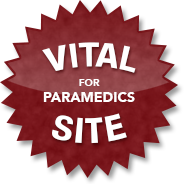 The attendant carried him him whilst the other EMT continually ventilated him. A colleague from my base station helped with the oxygen and that freed me up to begin the hand-over in resus. I stood and related the history and my findings, including drugs given and other treatment carried out, whilst the resus team and a paediatric registrar worked on the little boy. His mother and sister stood in isolation at the end of the room, distressed and overwhelmed. Before I left, the team had intubated the boy and had him on a ventilator whilst they worked out what could be wrong with him. I spoke to his mother, gave her a little hug and reassured her daughter, who burst out crying from a state of staring silence. I sat with the crew who had been with me throughout this and had a cup of tea (I don't drink tea usually). Then I got a lift back to my car, which had been left on scene. I said thanks and goodbye to the crew and off I went, back to base to reset my head and complete my VDI, not knowing whether we had saved the little boy or not. A routine job in the West End after that. A doctor had fainted in a cafe and had a bump to her head. She was fine when I arrived and a little embarrassed I think but lucid enough to refuse the offer of hospital care. She had fallen down after feeling faint, probably as a result of lack of sleep - she was extremely tired and I sympathised with her. I sat with her for a few minutes and we chatted about clinical decisions. Then I gave her the honour of the golden signature and I left. North London and my next call was to a 45 year-old with chest pains. He had no cardiac history and the pain was exacerbated when he breathed in. It sounded pleural to me; he had suffered a recent chest infection, so it wasn't a long shot. He was taken to hospital by ambulance just in case. I wouldn't risk leaving any chest pain at home. A four mile trip on blue lights in the opposite direction and I found myself watching my colleagues attend to the needs of a woman who had fallen down the escalators in a tube station and sustained the all-too-familiar groove markings on her head. I wasn't really required, so I assisted the crew by carrying some equipment back up the escalators as they gingerly walked the lady to ground level and into the ambulance. There were a lot of police officers in Whitehall tonight. At first I thought it was an anti-terror exercise but they were working in conjunction with Transport for London to arrest fare dodgers on the buses as they pulled up at the stands. A lot of money spent to save a few quid I think. A few minutes rest and then I was on my way to a regular location - a police station. A prisoner was unconscious. It took me 10 seconds to establish that he was feigning unconsciousness and that his acting abilities were in dire need of improvement. Still, he persisted in playing the dead duck. His eyelashes flickered when they were touched, he moved when pain was induced...he even adjusted his head to a more comfortable position when I moved it into a slightly awkward angle! He wasn't funny though. When the crew arrived and the paramedic began to induce a little more pain, the prisoner became abusive and aggressive, lashing out and grabbing my colleague's leg. It took four police officers to hold him down and sort him out. After that job I got a few routine drink-related calls. A young woman, lying in the rain, too drunk to understand she was alive. I waited with this lady, her friends and the police officer who had called it in until the crew arrived and we loaded her into the vehicle. She vomited a LOT on the way in and had completely dried up by the time she was in the back of the ambulance. Then I was approached as I sat on stand-by. A young woman asked me to check her friend's condition. She was drunk and couldn't stand up. It sounded familiar. Sure enough when I went around the corner I found a teenager flopped on a ledge, vomiting and being assisted by her friends, some of whom were a little too loud and active for my comfort. I suggested they all calm down and let me do my job. Luckily for me, they obliged. I called this one in and an ambulance plucked the young lady from obscurity to sobriety. A little time to myself during which I saw nothing of interest, I'm afraid and then off to another sector for a female with abdo pain and a PV bleed. The ambulance arrived on scene at the same time as me, so I simply assisted them with the young woman. The crew looked very tired and the EMT attending told me that they had been thrown from one end of the town to the other, non-stop and with no break. That's not amusing when you're on nights. My last job of the shift was for a male with chest pain. I thought the job was going to cost me sleep time, as it was creeping towards 7am but a crew were on scene and all I had to do was carry my bag back to the car with my false-alarm face on. And now some good news. I posted this days after the shift and I got a call today from the mother of the little boy who was 'fitting'. He survived and is back home, awaiting future scans for a possible cranial bleed. The only reason I know this for sure is that I gave his mother my mobile number and asked her to let me know what happened. Otherwise, as with the other serious jobs I have written about, I would simply never find out. Seven emergency calls. One non-convey, one false alarm, one no trace and four ambulances required. Before I had time to start my VDI there was a call on the screen for a male who had been stabbed in the eye in South London. I raced to the scene and there was an ambulance crew attending. I hopped aboard and learned that the 30 year-old man had been mugged for his mobile 'phone. The assailants had allegedly hit him hard on the head with something and then proceeded to try and relieve him of his left eye by stabbing it. They did a good job because the weapon had penetrated the eyeball and the man couldn't see out of it anymore. Although he was fully conscious and seemed to be in no great pain, he sensed the seriousness of his injury and kept asking whether he would lose the eye. He was rushed to hospital and I hope that they can do something for him. For some reason, only known to himself, a taxi driver slammed his vehicle into a post. I watched as he reversed from the impact point and carried on his journey as if nothing had happened. I couldn't see any passengers inside...or maybe they were all thrown to the floor. What is going on out there? Another fainted female and another non-convey. She was 20 years-old and very nice to talk to. She had fainted before and knew the score. Even though she was offered the opportunity to go to hospital and be checked out she declined. She had recovered fully when I arrived and I saw no reason to push the subject further, so she got the famous signing honour and off I went. I received a call from my Control desk about a job that was coming down to me and was told that there was possibly a child fitting at the address and to proceed with caution as there was a lot of commotion in the background. There was a crew there but the whole thing sounded very dodgy and when I got on scene I found myself walking cautiously up to the entry door of the flats. The buzzer was answered by a slow and very slurred female (Scottish) voice. "But you have a crew in there, don't you?" I pushed at the door but it didn't open. She hadn't pressed her door release and I was getting concerned now. I pressed the buzzer again. There was a delay and Mrs Slur came back on. Eventually I got in and made my way to the floor where the flat was. When the lift door opened I walked into the corridor carefully. I had imagined her and whoever else harming the crew and then lying in wait for me! I went into the flat and discovered that the crew were talking to a young man who didn't even want an ambulance. All the while this Glaswegian woman, who was extremely drunk, hung over my shoulder talking at me. I wasn't listening- I couldn't understand her to be honest. It turns out there was no child in danger at this address, just three stupid drunk people who had nothing better to do than call an ambulance out. The woman claimed her boy had been fitting and it's quite possible he had but he was taking diazepam and alcohol at the same time, so I suppose he was heading that way. Nevertheless he declined to go to hospital and I left the crew to work it out with them. Anti-climax. Later on I was called to a 53 year-old male with DIB. He did indeed have problems with his breathing and had been diagnosed with a chest infection. On top of that he was asthmatic, diabetic and suffered from angina, so he wasn't in good shape. I arrived to find him sitting in his cramped hallway with his family looking on anxiously. Once he was nebulised he began to recover but he went to hospital anyway, he needed a proper check up. I rested for a bit at my base station and then I was off to another stabbing. This time it was a 16 year-old boy who had been stabbed in the chest and was on a stairwell in a block of flats, or at least that's what the call description stated. In fact, when I arrived at the RVP, along with another ambulance and a few police vehicles, there was nobody to be seen. A search of the location revealed nothing out of the ordinary; no blood, no signs of violence. My control updated me and said that the alleged victim had called again from another location but this time he refused to say where he was. This was typical of a hoax call but also likely to be a stabbing victim who didn't want the police involved. I never found out which because the search was called off and I went back to the station. A few years back, I was told of a call just like this. It had come from a vague location and the caller had simply stopped talking and hung up after a while. Everyone searched but found nothing so it was assumed he was a prankster. The next day his body was found in a local graveyard. He had crawled his way there with multiple stab wounds and died in the night. Sad really. A quick call to a train station for a man who claimed he was having palpitations. He had been seen by the hospital doctor two days previously and nothing was found wrong with him. He was a homeless Romanian man and all he wanted was a bed I think. He got his wish; the crew took him to hospital. The rail staff who had tended to him before I arrived were not impressed with him and they apologised for wasting our time. I told them not to bother, it's better for them to call us than to risk getting it wrong. My last call of the night was to a 70 year-old female who was hypoglycaemic. She wasn't taking good care of herself at all and only had an elderly husband to help her. When I checked her BM it was extremely low - 1.5mMol. The crew arrived soon after I did and we set about reversing her potentially life-threatening condition. She wouldn't take anything orally, so she got an injection of Glucagon and that was followed up by a little Glucose IV. This did the trick and within ten minutes she was wondering what all the fuss was about. Her blood sugar level returned to normal and she was taken to hospital for further checks. All told, a good night's work I think. Eleven emergency calls; 1 non-convey, 1 running call and 1 on scene cancellation. I started the day as N377, the call sign for the amber car. Then it all got a bit confusing when it was changed after my first job to CS47, the sector car call sign. Apparently that's the way it will stay from now on - I am told that the amber car is officially dead. We'll see. My first job (as the amber car) was to a call 4.5 miles away; a RTC involving a cyclist and a van. I got on scene, eventually and the cyclist, a rather tall chap, was sitting on a wall with a police officer in attendance. The cyclist had been clipped by the wing mirror of a white Transit van and was consequently lobbed off his saddle and onto the road, where he accrued a few minor injuries (mainly abrasions and bruises) to his legs and hands. Fortunately for White-Van-Man the speed of the collision caused no serious injuries. Unfortunately for said WVM, the cyclist was a criminal barrister. Pregnancy and back pain are common enemies. A call to an underground station for a pregnant woman with back pain had me thinking about poster advertising and how it could help to deliver this message to young pregnant persons: 'Your back will ache, see your G.P.' Followed possibly by a campaign aimed at the pre-imminent deliverers, simply captioned 'Contractions started? Get a taxi to maternity. You've had 9 months to save up'. Every now and again, I will get a call for which nothing more than a plaster is required, these still tend to come in as emergencies but they don't need to go to hospital. Like the 70 year-old man who tripped on loose paving and fell on his head, resulting in a cut above his eye. He refused to go to hospital and, after carefully checking his obs., I agreed that he didn't need to anyway. He wasn't knocked out and he was fully alert and aware. I put a strip across the wound, got him to sign my 'get out of jail free' form and left him to it. Then on to the tiniest alley in the world, to a posh(ish) hotel in the West End for a 36 year-old male with chest pain. It was very difficuly to squeeze down the lane leading to this establishment and when vans parked on the kerb, it became almost impossible. The ambulance must have had a great time trying to get out of the place by the time they had loaded the patient up. Luckily, he wasn't suffering any cardiac problems. It looked and sounded as if he had simply had a panic attack. The cycle responder was on scene before me and, after a quick chat and liaising with the ambulance crew, I left. Another trip and fall, this time an elderly lady who had fallen and hit her head on the floor of an indoor market. She was knocked out, according to witnesses, but was conscious and alert when I got to her. The ambulance crew arrived within a minute and we took her in the chair for a proper check up. The lady had a nasty bump developing over her eye but she seemed fine otherwise. I assumed the gentleman with her was her husband and so I referred to him as such but he corrected me - "I'm her partner", he said. Oops. Here's a classic failure of human communication and common sense. I got a Red3 call for a 'leaking catheter; patient to be transferred'. First of all, I'm on the car and can't do transfers, secondly, the patient lived literally on the corner of the hospital and finally, there was no way on Earth that this could be categorised as a RED call! It simply wasn't an emergency. How could it be? I called my Control desk to raise these points and was told that there was a new system in place and that these calls were going to slip through the net and we still had to respond to them as emergencies. This is despite the fact that anyone, absolutely anyone, looking at it would know that it was NOT a life-threatening emergency. I arrived on scene and when I finally got to the flat the patient expected me to change his catheter and I can't do that. Shockingly, the call had been made by the District Nurse who was sitting on the sofa in the same room, shouting down her mobile phone. When I tried to talk to her she raised her hand and said "just a minute". Now that didn't please me at all and I know she saw what registered on my face at that moment. The patient became annoyed with me because he had expected to be sorted out (quite rightly) as a result of my being called. He did not want to go to hospital (around the corner) but I explained to him that there was no option and then wondered why the nurse wasn't able to fix this leaky catheter for her patient. I couldn't see the point in her being here if she had no skills to use. Maybe one of my nursing readers can help with this one. Believe me, I wasn't angry with the patient or the nurse, although she was incredibly rude (and loud). I was angry at being put in such an awkward situation by the new system, of which I was told nothing when I started my shift. Apparently, the Government are behind the new change of goalposts. Keep your eye on Tom Reynolds' blog for more detail; I don't do politics here, as you know. Eventually, the man was taken to hospital (around the corner) by the ambulance crew, who were just as mystified as me. Later, I was cancelled on scene by police after a RTC call in which a motorcyclist had been knocked off his vehicle. He didn't want to go to hospital and had stormed off in a huff. A large part of Covent Garden was closed off because of a suspect package and I got myself stuck in a dead-end or two whilst trying to respond to a call for a male who was having an epileptic seizure in a park. I got there late as a result and the motorcycle responder was just ahead of me. Neither of us knew where exactly this patient was in the park and so we started looking around. I saw a woman running down the path and thought she may be connected but then I didn't want to move unless she actually was something to do with the call. As she got closer she waved at us and I got back in the car and headed towards her. I gave her a lift back to where the young man had been fitting. She was puffing and panting after her mini-marathon, so it would have been rude to drive off and leave her to hoof it back, right? He was standing up, supported by a few people around him and one of his friends. He had been seen fitting on the grass, although his friend said he wasn't epileptic. He was still post ictal and had to be persuaded to sit in the car until I could complete my obs. Meanwhile, the police and the ambulance had arrived - communing on the grass in the sunshine. Lovely. If we weren't all on duty we could have had a 999 picnic. Anyway, he was taken to hospital with his friend in tow and as soon as I had completed my paperwork, another call came in for yet another 'male fitting'. This time in a Knightsbridge store (no, not Harrods. Nice try). I was taken a few floors up by security and found the man lying next to one of those long shoe-fitting benches. His wife was with him and she explained that he had been receiving treatment for a brain tumour recently and today he had suddenly collapsed and had a fit of some kind. You may remember that I dealt with exactly the same type of call a month or so ago. After treatment for brain tumours, swelling can occur and this can lead to momentary deficits, headaches or seizures, as in this case. The man still wasn't fully recovered when I started talking to him; he was confused and a little agitated. His wife requested that he be taken to a private hospital where he was receiving his treatment. She became quite upset when I explained we couldn't do that. When the crew arrived, the attendant also explained that, as she had called 999, he would be taken to the nearest NHS hospital with an A&E department. He could then be transferred to his private hospital if it was deemed safe and appropriate to do so. After that call, I got a few minutes to myself on stand-by. I was approached by a homeless man who asked me to check his eye, which had swollen after he had fallen down drunk the previous night. I know this because he was quite candid about it. I didn't recognise him and asked him if he was new to the area. He laughed and told me he had been sleeping rough for 40 years! I asked his name and told him mine (I usually do this). I shook his hand and off he went, happy with the advice I had given him. Then a call to a male in his 60's who had fallen down some steep steps and bashed his head hard enough to knock himself out. He was drunk and he wasn't shy about it. Despite the fact that he was now fully aware and had nothing more than a minor head injury, he was taken to hospital for a proper examination...and a chance to sober up. A ? anaphylactic reaction at a department store next. A 19 year-old female was lying on the floor of one of the stairwell landings, feeling unwell after eating shellfish. She had no allergies that she knew of and her airway was fine; no trouble talking at all, but she was vomiting regularly and this concerned me. After I had covered all the other bases; pregnancy, medication, etc., I assumed she must be reacting to something she ate, quite possibly the shellfish she mentioned. The ambulance crew took her to hospital with a bag under her chin, just in case. My final call, a running call, was for a young Slovakian girl who felt she had something in her eye. She was with a male friend, who spoke English and was her translator for the trip to hospital. I had examined her eye and could find nothing in it. I flushed it with saline and still she felt something there. I knew it was possible that she had a corneal abrasion and the scratch could feel like an annoying foreign body in the eye. I was hoping the eye casualty would be open but it wasn't. I had to leave the girl and her friend in the crowded waiting area with a possible three hour wait time - especially if all you have wrong with you is a scratched eyeball. On my way back to base I noticed a police patrol car with a couple of stickers on the side. Advertising stickers, one of which was for HSBC bank. Is that for real? Please tell me that isn't the future.